In his State of the Union address on Tuesday, January 25, President Obama announced that by 2035, 80% of America’s electricity will come from clean energy sources. Now, the first question that comes to mind – what are we counting as clean energy? The second question – what do we have to do to get there? “Some folks want wind and solar. Others want nuclear, clean coal, and natural gas. To meet this goal, we will need them all.””Some folks” may have been a bit surprised and perhaps disappointed to see nuclear, clean coal and natural gas included that statement. Do an internet search for clean energy, and you’ll come up definitions that include the words–sustainable”, renewable, “green, environmentally-friendly, and non-polluting. Usually included are references to wind, solar, biomass or biofuels, hydropower, and geothermal. Usually not included are nuclear and hydrocarbons, which, by nature, are extraction intensive, depleting, and generate waste in one form or another. Some definitions do include natural gas, however. Proponents of nuclear, coal and natural gas were no doubt pleased by the President’s statement. Correction, clean coal, that is. One might question whether the statement was really sincere, or whether the separation into two sentences with the words “Some” and “Others” was some sort of code: “Some” sources of energy we like, “Others” we don’t. Nuclear, after all, has the decades-old waste disposal problem. The problem didn’t get any better last year when the government pulled the plug on the Yucca Mountain disposal site in Nevada. The natural gas industry was no doubt happy to be mentioned, and usually gets props for being the cleanest of the hydrocarbons in terms of carbon dioxide. There is that little practice of hydrofracking, however, on some people’s minds. Then there’s coal, I mean clean coal: provider of over 40% of our electricity now, but the worst of the hydrocarbons in terms of carbon dioxide, and that’s without mentioning its other problems that from time to time crop up in the news (explosions, fly ash, dam failures, and mountaintop mines). Clearly, when it comes to the idea of whether coal can be “clean”, there are those who don’t believe it and those who believe there will be a technological solution to the problem of carbon dioxide. Nevertheless, the country does have vast reserves, and the key to remember here is domestic jobs. “… I’m asking Congress to eliminate the billions in taxpayer dollars we currently give to oil companies. I don’t know if you’ve noticed, but they’re doing just fine on their own.”Also left out of the clean energy statement was biofuels, but again, we’re talking electricity, not transportation. Biofuels had their own special recognition in the President’s statement: “With more research and incentives, we can break our dependence on oil with biofuels, and become the first country to have a million electric vehicles on the road by 2015.” Others in the unmentioned category are hydropower, geothermal, and fuel cells. Hydropower is already a significant contributor to renewable energy in EIA electricity statistics. Don’t expect any growth in this sector, unless you’re thinking of tidal power — dropower is a still just a nice way to avoid saying the word dam. Geothermal is looking like the Rodney Dangerfield of renewables; if it’s not third behind wind and solar, it’s left out entirely. Its omission on Tuesday appeared intentional. Fuel cells were mentioned in another line about innovation, but, we’ve been hearing about them for years. Hybrids and EVs are winning in transportation, and so are wind and solar in serious power generation. Like geothermal, fuel cells went unmentioned for a reason. Clearly, if we take quick look at our current electrical energy balance, we see it makes a big difference whether nuclear, coal and natural gas are included in the clean energy mix. EIA statistics show our current sources of electricity are currently 45% from coal, 23% from natural gas, and 20% from nuclear, for a total of 88% from the three. Looking out to the year 2035, EIA projects US. electricity demand growing from 4 trillion KWH per year to 5 trillion KWH per year (See Chart). This is a growth rate that roughly mirrors the Census Bureau projections for US population, growing from 310 million people now to 389 million by 2035. Source: U.S. EIATwo areas that might cause EIA projections to be low are electric vehicles, which will increase home use for overnight charging, and a shift way from fossil fuels for home heating. Let’s assume, though, that the EIA projections are accurate. 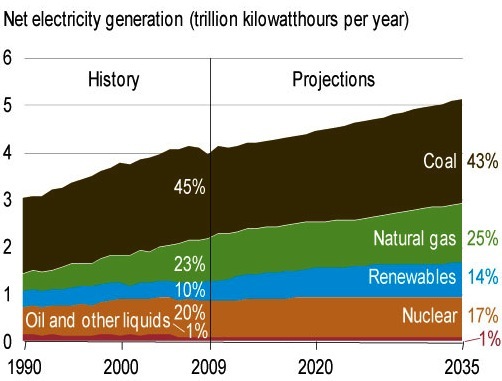 By 2035, EIA projects the relative contributions from coal, natural gas and nuclear to be about the same: natural gas increasing to 25%, coal dropping to 43%, and nuclear dropping to 17%. Renewables, of which hydropower is currently dominant, are forecast to grow from 10% to 14%. That growth will come from wind and solar as hydropower will obviously remain flat. With the counrty needing 5 trillion KWH per year, reaching the goal of 80% “clean” means we need 4 trillion KWH per year to come from the clean category. Obviously, counting natural gas and nuclear as clean makes the goal a lot easier. Now, all we have to deal with is cleaning up the 43% portion from coal, meaning, get rid of the carbon dioxide emissions. To reach the 80% number, all we really have to do is to get half the coal, at least 1 trillion KWH per year, into the clean category. Fans of wind and solar will be saying at this point: wait, we don’t need coal, just put more resources into wind and solar. Perhaps that could work, but there are those who say wind and solar will have their work cut out for them just getting renewables up to the 14% number. Reading between the lines, then, we might expect to see more than a few clean coal ads cropping up in the future. About The Author – Bill Willoughby is a Mining Engineer, and he blogs at Resource and Environment. Natural Gas: Worse Than Coal & Diesel in Greenhouse Emissions? The views and opinions expressed herein are the author’s own and do not necessarily reflect those of EconForecast (Economic Forecasts & Opinions ).